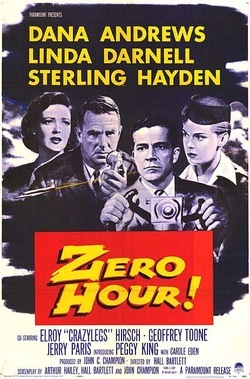 Out Of Context Cinema: Zero Hour! At the end of last year I did a post about a few of the classic films that I had recently discovered. I not only waxed rhapsodic about the surprising quality of the Airport films of the 1970s, but noted how spot-on the Zucker Brother's comedy Airplane! spoofed them. And then I got schooled in the comments. Airplane! is indeed a spoof of the disaster movie genre, but it cribs mostly from one film: Zero Hour!. This 1957 low-budget airplane suspense film has the same plot, characters, and much of the same dialogue. Both films even feature a former pro-athlete in the cockpit (the 50s version being footballer Elroy "Crazylegs" Hirsch). No wonder that Leslie Neilsen style of acting worked so well - the original is pretty much all in that same awkward mater-of-fact brusque attitude. None of this is surprising when you find out that the producers of Airplane! purchased the script and remake rights to Zero Hour! after accidentally catching the film on late night television. Airplane! is half parody - and half loyal remake. It was the massive success of the Airport films (especially Airport 1975, a blockbuster despite being a critically derided sequel) which allowed for funding of a big-screen parody, and there are many elements from those films that are also lampooned (as well as Saturday Night Fever, From Here to Eternity, Jaws, etc etc). But the heart of Airplane! belongs to this weird little Canadian made thriller. Little matter - as both Zero Hour! and Airport are based on the stories of disaster scribe extraordinaire, Arthur Hailey. Airplane! aside, Zero Hour! was just as legendary as a late night TV staple even before morphing into a cult parody. Now it is finally on DVD. While the film is certainly no masterpiece, at a brisk 81 minutes, it is certainly worth watching. And not only for all the in-jokes. Any chance to catch Sterling Hayden chewing up the screen is worth your time. Still, the best way to watch this film is to invite a bunch of friends over, tell them you're going to watch a classic comedy airplane disaster film - and then slip in Zero Hour! This was a great post. I had no idea that Airplane! was based off of an older film, and it's one of my favorite movies. I hope you don't mind, but I linked to this article on my own blog. Very interesting stuff! I saw an interview with the Zuckers and they said that when they first saw this, they wondered why the kid didn't say something like, "Say, aren't you Crazylegs Hirsch?" Why didn't anyone in the film recognize him? That was the origin of the segment in Airplane! where the kid recognizes Kareem Abdul Jabar. Excellent post! As an Airplane! fan, it was eerie watching that clip. Is it just me, or is that cockpit bigger than most hotel rooms? That, and at one point they cut to a shot of the altimeter during one of the turbulence scenes...."oh no, we're climbing!"